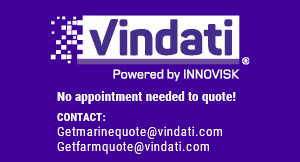 Vindati puts the power in the hands of the broker, providing instant customizable quotes generated with leading technology, integrated data and analytic tools. Vindati offers specialty products and solutions for brokers, both traditional and digital, serving small to mid-sized businesses. Contractors Equipment, Builder’s Risk, and Farm/Ranch owners packages are available now, with a range of other business products coming soon. Vindati is a new way to access insurance. We’re all about collaboration, bringing people and technology together to improve the broker experience. Our simple, no-touch, tech driven solution to servicing small businesses is the way of the future. Bringing automation to small business insurance will better meet the needs of the entire industry. Vindati can be accessed through a wide variety of distribution channels, including email and AskKodiak. Regardless of how brokers plug in to Vindati, the goal is a seamless, easy to navigate interaction that places the broker at the center of the transaction. Discounts available for good credit scores and security/safeguard, among others. View all discounts and instantly adjust quotes accordingly using Vindati’s online quote customization marketplace.